The WDT-3500 Walk-Around Downdraft Table Portable Cartridge Dust Collector by ProVent is the ideal ventilated and filtered work station for hand tool applications that need room to maneuver. Large pieces can be laid across the entire body of the machine. Downdraft ventilated work areas are available on three sides of the unit. The WDT-3500 has 1,000 SQ FT of filtration media allowing extended use between pulse cleaning and replacing filters. Plus, the WDT-3500 uses 5″ casters for complete portability. 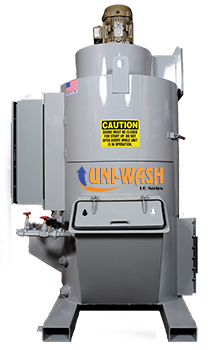 The machine can be positioned slightly or completely moved to another area of your facility! Caster locks hold the unit firmly in place when needed. Call us today to find out more about how our Walk-Around downdraft table can be used in your application. External Coating Durethane DTM By PPG is a Direct-To-Metal Urethane Mastic Coating that is Chemically Resistant and Extremely Durable. Work Deck Size 95" x 40"